How to make Atlantic City a major attraction for non-gamblers? It looks like Atlantic City is starting to think outside of the casino box as it plans to reinvent itself. City Council has approved a 205-foot observation Ferris wheel and a zip line along the boardwalk as it looks to recapture lost tourism dollars that led to four of 12 casinos closing their doors in 2014. This got me thinking. How else could Atlantic City expand? What else could they do to make sure that they’re not completely reliant on casino gambling to support the local economy? Here are three big ideas that are feasible and could very well change the way we think about Atlantic City. 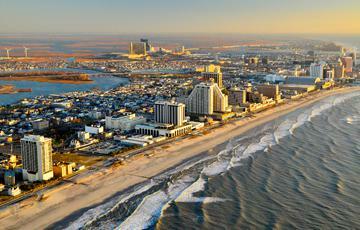 Atlantic City is typically a summer destination. I’ve been in September and the boardwalk has been pretty dead. I haven’t been in the dead of winter and I don’t imagine the boardwalk has a ton of activity happening in sub-zero temperatures. But you know where else is freezing cold in the winter? Niagara Falls, Canada. And you know what city is buzzing with people from December through February? Niagara Falls, Canada. That’s because in addition to their two casinos and kitschy museums, they also have three different indoor waterparks, including Fallsview Indoor Waterpark on top of a hotel, Great Wolf Lodge, and a smaller park at The Americana. I’d love to see Atlantic City open an indoor waterpark right on the Atlantic Ocean. Not on the boardwalk. Not at an adjacent hotel. Put it over the ocean and have clear slides zooming out over the Atlantic. And since it would be indoors, people would flock to it in winter, especially if it’s connected to a hotel via a covered walkway. Atlantic City can be brutally hot in the summer. While people love to be outside by the ocean, not everyone prefers the heat. That’s why an indoor ski hill would do so amazing. You could keep it open all year round and attract people to Atlantic City who would never associate it with a skier’s paradise. Put a retractable roof on it and it would be the ultimate destination of any season. Seems a little far-fetched, right? How would a movie studio actually attract more people to Atlantic City? Well, at first it might not. But that doesn’t mean it can’t help the economy. By opening a movie studio (or multiple studios), you could very well help the thousands of out-of-work casino employees find new employment in a completely different sector. The government just needs to provide big tax credits to production companies that agree to bring their business to Atlantic City. These are just a few of my ideas to reinvent Atlantic City. And I’m just a writer, not an entertainment and attractions guru. Imagine what someone who does this kind of stuff for a living could come up with.